« Ideologi: Vladimir Putins ”civilisationsnationalism”! Strategi: Att besegra en fiende! KAMPANJ | Liberal Democrats var partiet som inför förra valet kunde suga upp väljare som var trötta på de två huvudmotståndarna. Inför valet 2015 kan det vara UK Independence Party som blir alternativet för missnöjda väljare. Risken är den samma för både Conservative Party och Labour; att man tappar så pass många väljare till UKIP att man inte kan bilda en egen majoritetsregering. Både Tories och Labour slipar därför på strategier för hur man skall kunna underminera förtroendet för UKIP. Men inget parti vill vara allt för tydliga med sina attacker eftersom riskerar irritera de av ”sina” egna väljare som uppfattar UKIP som ett alternativ. 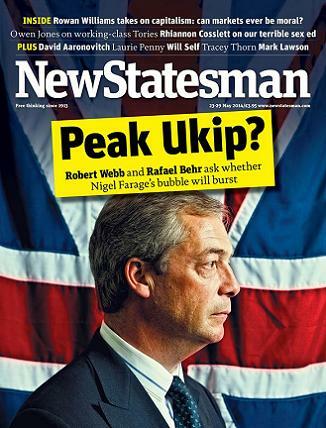 Rafael Behr, på tidskriften New Statesman, skriver om partiernas våndor inför utmanaren Nigel Farage och hans UKIP. Downing Street is becoming more aware of the limitations of “Vote Farage; get Miliband” as a message. One No 10 source tells me: “It will have to be more sophisticated than that.” The general election campaign will stress economic dependability. Cameron will be sold as the only candidate who can be relied upon not to poison the recovery with snake-oil policy prescriptions, whether bottled as Farage’s fearmongering nationalism or as Miliband’s wealth-destroying retro-socialism. Labour has been slow in waking up to that dynamic. At first, the opposition tended to view Farage’s strength as a helpful disruption of Tory support – a family feud on the right that eased Miliband’s path to Downing Street. Then it became clear that Ukip was attracting support from older, working-class voters who felt neglected by Labour in government, especially over immigration policy, but remained culturally immune to voting Tory. At that point, Miliband’s allies conceded that there was a potential hazard down the line but insisted it was not big enough to cost Labour seats in the 2015 general election. Only in recent weeks have aides started voicing concern that Ukip is dragging the whole political debate on to terrain that the Labour leader finds inhospitable. Ukip’s reach may be limited by its status as a vehicle for protest votes but that gives it power to define the terms of protest in ways that harm the constitutionally recognised main opposition party. Labour’s priority is to look like a government-in-waiting but part of that image requires also looking like the main destination for people who don’t like the incumbents. Instead the party is lumped in with the Tories and Lib Dems as part of a shabby establishment stitch-up, with the added baggage of a reputation for economic mismanagement. It is an old opposition conundrum: how to fashion a message that is dramatic enough to represent a credible alternative to the status quo, yet responsible enough to withstand scrutiny as a potential programme for government. Ukip isn’t bothering with the second part of the equation (which will be its undoing next year), but Farage is hogging the rhetoric of change and upheaval. His incendiary nationalism burns up the oxygen of publicity that Miliband needs to illuminate his milder offer of soft-left populism. That all suits Cameron to the extent that he is in the business of promising security through continuity. While Labour and Tories have opposing reasons for wanting to see Farage thwarted, the basis for their arguments is the same. Downing Street aides and Miliband advisers both speak of the need to impress upon voters how high the stakes will be in 2015; how the ultimate question is whether Cameron is allowed to continue as Prime Minister – with one side warning that another term of Conservatism would finish off hope of fair rewards for all and the other warning that Labour would guarantee national bankruptcy. What they want, above all, is for the public to view the general election as a two-party race, with the Lib Dems and Ukip as sirens, luring in wasted votes and thereby abetting the real enemy. The threat that situation poses to Cameron lies in the electoral arithmetic – Ukip can cost him seats. For Miliband, it is a problem of momentum – Ukip has stolen his insurgent thunder. The Tories spent too long chasing Ukip’s agenda; Labour spent too long ignoring it. Farage’s bubble will not suddenly burst. More likely, the air will seep out slowly over the coming year, by which time both Cameron’s and Miliband’s prospects of winning a majority may already be blown away. Tidskriftsomslag: New Statesman den 23-29 maj 2014.